Saint Andrew's Court - Strasman Architects Inc. This project was initially designed for Saint Andrews Church as way to generate rental income to pay for the repair and maintenance of the church property as well as funding their mission in the Ottawa community. 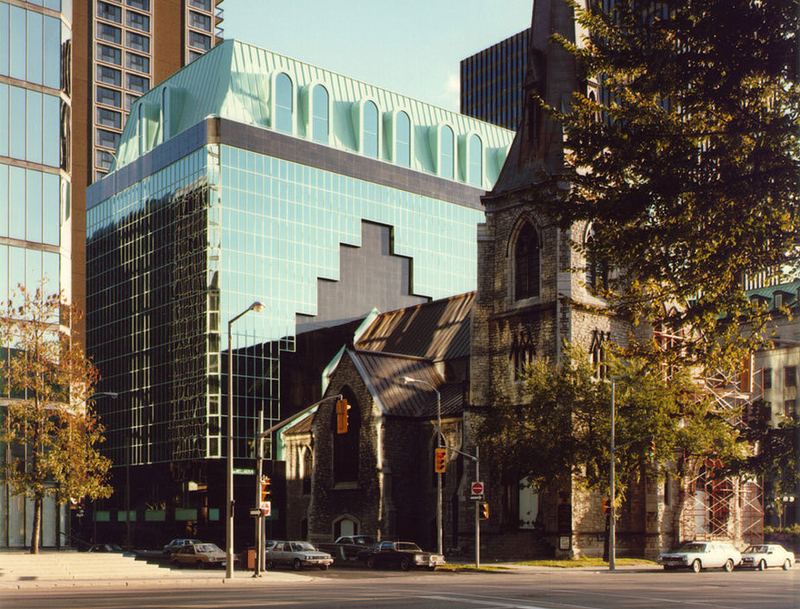 The Church had no appetite for development so they turned it over to Nansen Developments who then was bought out by the Bank of Canada who required additional space. 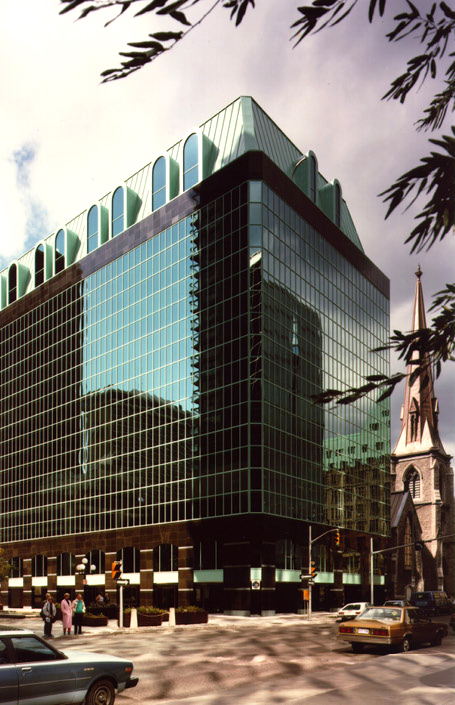 Jim Strasman was very familiar with the Bank of Canada having designed the Head Office for the Bank of Canada located just across Kent street,while with Arthur Erickson Architects. It was a natural fit. With the Bank of Canada as the client the original concept had to be reworked completely. The underground became very complex because of the security involved in all deliveries, which had to come from Queen Street, to the Bank. The two buildings also had to be connected by a pedestrian tunnel running under Kent street. 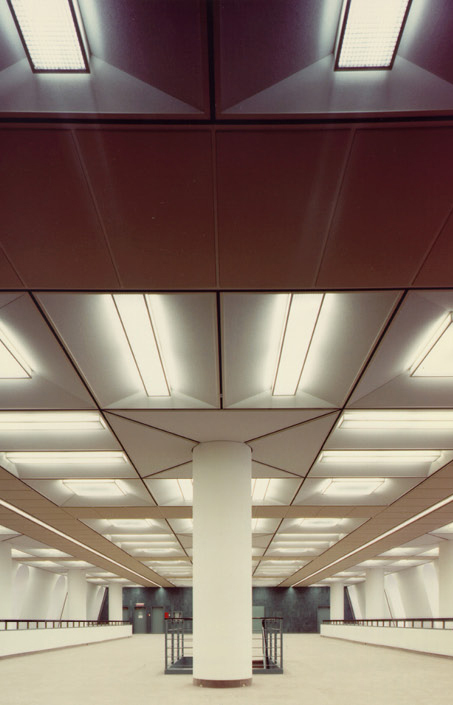 The Bank also required large open floors to accommodate their interior office layouts. Because of this we eliminated the central core and placed the core elements in two separate cores –one at each end. With these adjustments the Bank was able to use its’ standard furniture systems and office standards. The real challenge though was how to integrate the historically designated St Andrews church into the overall composition. The famous organ had to be accommodated on the second floor and the fire rating requirements dictated a prescribed amount of fire rated material between the church and the tower. A landscaped courtyard was designed between the church and the Department of Veterans affairs building with a raised seating area due to the structural depth required by the truck loading area below. 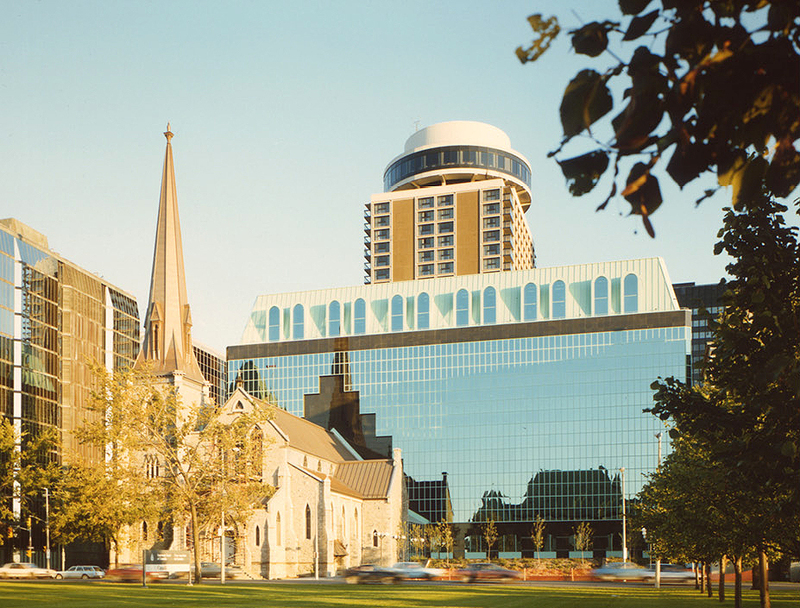 The buiding is clad in granite ,glass and green metal panels echoing the colour of patinated copper roofs, common in Ottawa.